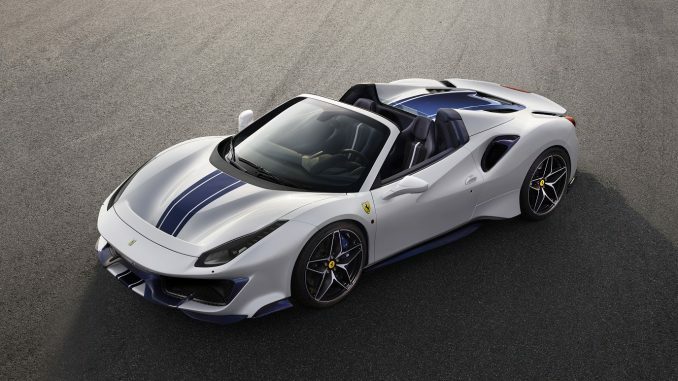 Ferrari’s new Special Series model, the Ferrari 488 Pista Spider, made its debut at the world-famous Concours d’Elegance at Pebble Beach in California last weekend. 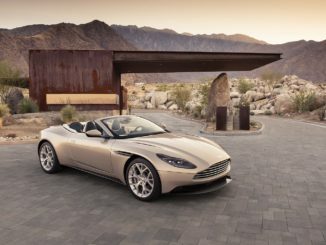 This is the marque’s 50th drop-top model and the US was purposely chosen for the launch, as North American clients are particularly fond of their high-performance convertibles. This new Ferrari has an unprecedented weight to power ratio of 1.92 kg/cv for a spider and has therefore been given the most powerful Ferrari V8 engine to date. This engine’s 3902cc twin-turbo V8 unleashes 720 cv and gives continuous and unending acceleration all the way to the red line and of course that unmistakable unique Ferrari engine shrill that will get passers by turning their heads. 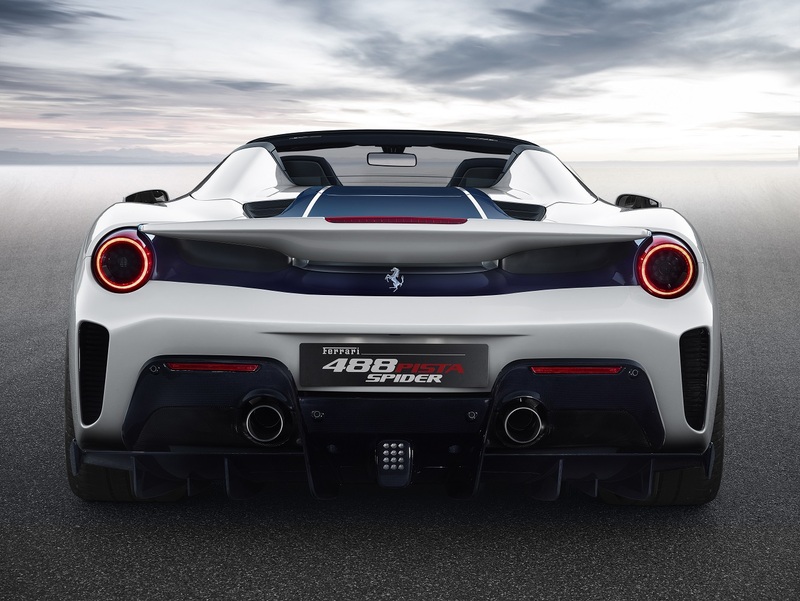 The Ferrari 488 Pista Spider is the natural next development stage of the coupé version whilst maintaining that perfect marriage of aerodynamic efficiency, purity of form and racing spirit that Ferrari is known for. The white stripe you can see in the photographs that runs the full length of the car is part of the car’s central livery, ending with the rear wing and is meant to represent the continuous airflow accentuating the lines of the car. 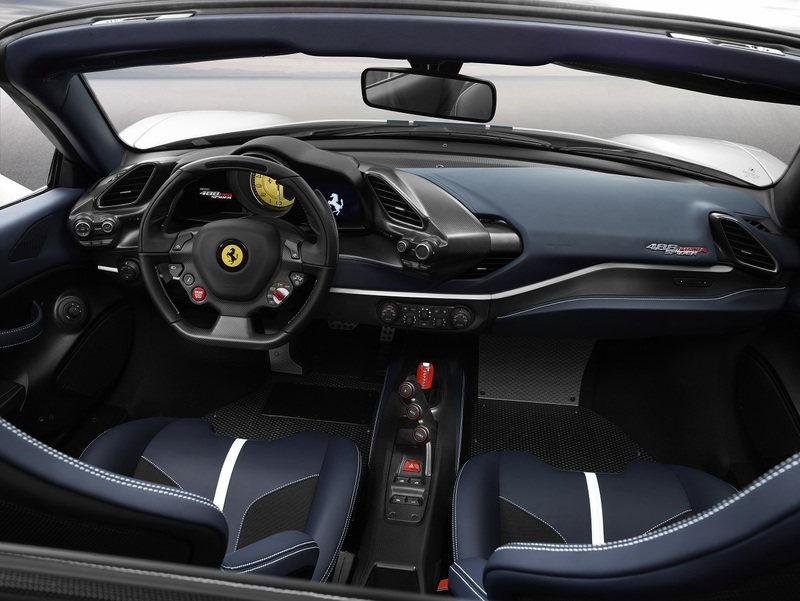 The 488 Pista Spider is made of lightweight materials in order to save weight which includes the use of carbon-fibre and Alcantara® throughout the vehicle. Even the carpets are replaced with patterned aluminium foot plates. And don’t try looking for the driver’s interior door handle as it’s just a simple strap, again to save weight. 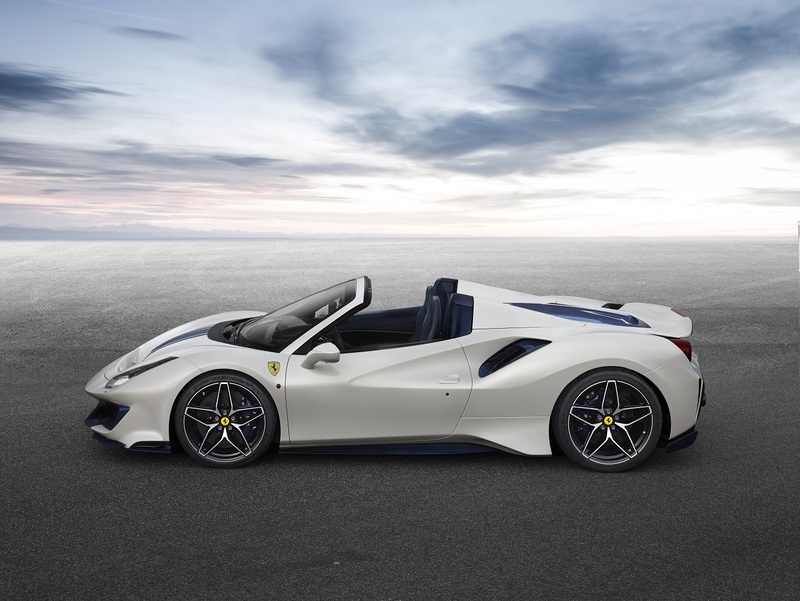 For those of you interested in what lies beneath the sleek exterior, the Ferrari 488 Pista Spider is directly derived from the 488 Pista and benefits from all the racing experience gathered with the 488 Challenge and the 488 GTE. 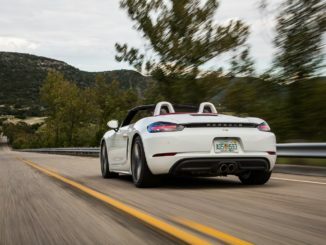 As a driver, you can expect razor-sharp acceleration coupled with a lightning-fast gear shift, precise steering, taught grip and second to none handling and of course heart stopping braking. You can expect a unique driving experience like no other thanks to the newly developed lateral dynamics control system and Ferrari Dynamic Enhancer (FDE), making on-the-limit driving far more intuitive, satisfying and thankfully predictable. The car’s pretty looks are complimented with beautiful diamond-finish 20” alloy wheels that come with a novel 10-spoke star-effect interpretation of Ferrari’s traditional mid-rear engine berlinetta-style rims. And for those of you really wanting to shed that weight, then there is a one-piece carbon-fibre wheel option that will save a further 20%. Performance wise, the engine is a V8 – 90° twin-turbo with an overall displacement of 3902 cc. Maximum power output is 530 kW (720 cv) at 8000 rpm and maximum torque is 770 Nm at 3000 rpm in 7th gear. 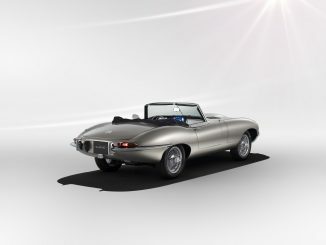 The car will accelerate from 0-100 km/h in a blistering 2.85 seconds and 0-200 km/h in just 8 seconds. The Ferrari 488 Pista Spider has a top speed of 340 km/h. 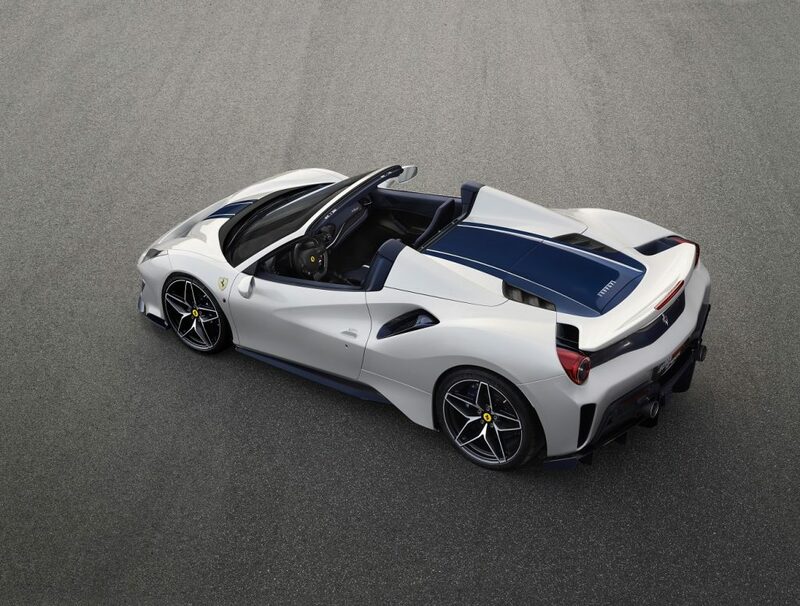 This is not only a stunningly beautiful car, but it is also engineered to give the ultimate driver experience and is Ferrari’s most powerful convertible in the marque’s history.